Workforce Unlimited Premier Division (KO 2.30pm): Pointon v Railway Athletic (D. Lovell), Railway Reserves v Coningsby (T. Sharrock), Swineshead Institute v Skegness Town Reserves (N. Saunders), Wyberton Reserves v Spilsby Town (R. Crozier). 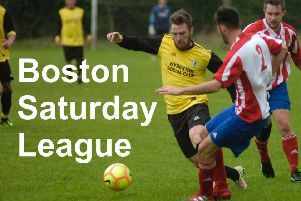 Workforce Unlimited Division One: Boston College v Freiston (G. Hurst), Friskney v Skegness United (M. Winwright), Old Doningtonians v Horncastle Town Reserves (C. Forbes), Woodhall Spa United v Kirton Town (S. Gillespie). Workforce Unlimited Division Two: FC Wrangle v Railway Reserves (P. Hindle). Workforce Unlimited Division Three: Wyberton A v Park United.